Is your business ready for when disaster strikes? Are you storing local and offsite copies of your business critical systems? I want to concentrate on growing my business. I want to secure my IT networks and ensure compliance. I want to migrate my IT infrastructure to the Cloud. I want to consolidate my voice and data systems. I want to simplify my print management. I want to prepare my business for a disaster. 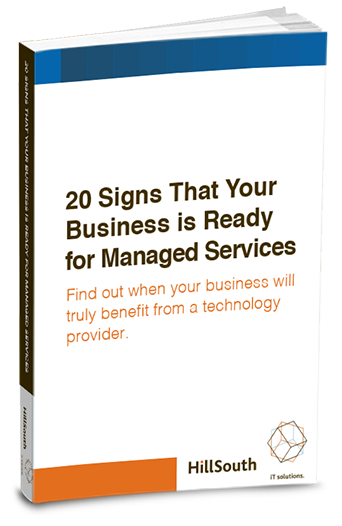 Is your business ready for Managed Services? HillSouth’s services are delivered either on-site with customers’ existing server infrastructure, or through our state-of-the-art datacenter. We ensure that clients can focus on their business, not on their IT demands. Is your healthcare organization or SMB HIPAA and HITECH compliant? Refer to our checklist to find out if your system is secure. PAA Security Policy Checklist: Use this guide to compare your internal HIPAA policies to the cross-referenced HIPAA regulations by number that apply to computer and physical security measures every healthcare group must have in place. HillSouth has experience helping students in both K-12 and Higher Education reach their full potential through reliable IT services and products. 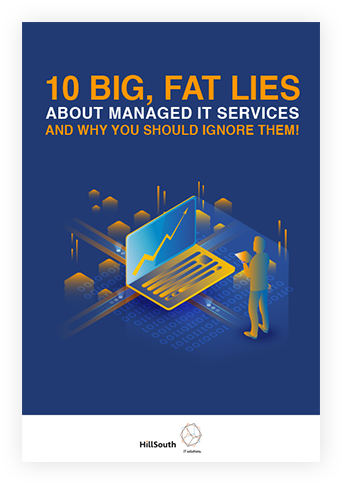 Learn the top 10 benefits of an outsourced IT department and how proactive IT support from a large team can be better for your company than pay by-the-hour IT response from a typical IT support firm. Please fill in the form below to get your free case study.